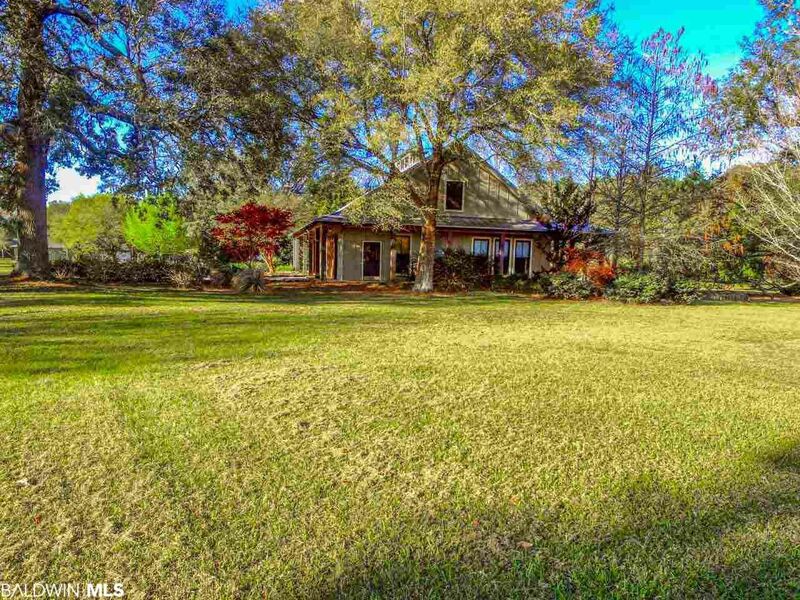 Incredibly unique in design and able to withstand hurricane force winds is this French Country Retreat nestled near Fairhope. From the custom stone work on the wrap around porch to the outdoor grilling area with its own lighting and ceiling fans, you can enjoy the outdoors in comfort. Speaking of comfort… a dual central HVAC system with 4 zones keeps everybody happy! Living options are endless with 3,670 sq ft to make this insulated concrete form home flexible. Up the custom staircase is a loft with kitchenette and the upstairs bathroom boasts a chic country theme with jetted garden tub to help massage the day away. As if the ICF Block wasn’t enough to keep out the elements all the doors and windows are custom made to fit by Marvin. Shade is provided by beautiful trees all along the property but one in particular is a Live Oak tree that would give Jackson Oak a run for its money! Raised Garden Beds on the back side of the house along with a 24x24 shed with power, water closet and sink make working this land enjoyable. The handyman will appreciate the air compressor ready lines, dedicated welding outlet as well as a section being insulated and ready for an air and heating unit. The dry barn out front has a 30x20 foot secure area along with both sheds giving ample covered space. Back inside enjoy custom finishes like built in Antique Stained Glass, Custom Built Cypress and Heart of Pine buffet and matching recessed wall cabinet. Details like reclaimed interior doors, heart of pine and cypress flooring, custom stair railings, custom window sills, repurposed bathroom vanities and lets not forget the very boisterous kitchen with matching Jenn-air refrigerator and Gas Stove. Now to the most distinctive feature of this whole property, the matching 10x8 Barn Style Sliding doors that adorn the front of the home, imagine opening these doors to enjoy a beautiful Eastern Shore sunrise or an afternoon breeze, these doors make the home absolutely exceptional.